Our NOVELTEA story started in 2015, when both Lukas and I moved from Germany to the UK. We first met at St. James Park, well-known Newcastle United football stadium. Ever since then, we see Newcastle as our second home, calling ourselves ‘Germans by birth and Geordies by choice’. The idea of an alcoholic tea blend existed separately in our lives, but it was the British fascination for craft beers and spirits, alongside deeply rooted tea traditions that inspired the beginning of our partnership. We knew that the British afternoon tea, with a glass of champagne and prosecco, played a significant part in British culture. Therefore, we were surprised that no one had combined two Brit’s favourite drinks: tea and alcohol. We immediately saw a business opportunity in this gap in the market. After 8 months of market research, product and brand development, we launched an innovative alcoholic tea blend; NOVELTEA. In the North East, Fenwick’s flagship store in Newcastle is well-known for its fabulous food hall and excellent service. During our product development phase, we visited their ‘wine room’ every day and through observations we gained great insights about the customers, their behaviour, the alcoholic beverage landscape, and the importance of branding. Thus, market insights and our ambition to develop an international brand around alcoholic tea blends guided us in building a business and a brand that ticks the retailers boxes, as well as perfectly targets our customers. Our first retail partner was Fenwick Newcastle and after launching NOVELTEA there, this ‘reference sale’ made it easier to start conversations with well-known retailers like Harrods, The Whiskey Exchange and John Lewis. These premium retailers loved our innovative idea, excellent flavours and attractive branding. 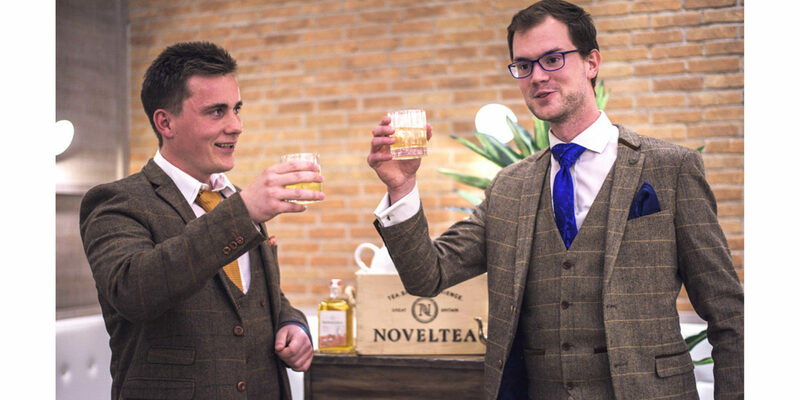 Tea Venture, the founding company behind the NOVELTEA product, considered crowdfunding from the very beginning as a finance option to support our business idea. We started our Crowdcube campaign in order to gain marketing exposure for NOVELTEA and to reach our product potential through NOVELTEA lovers. We want to involve our shareholders as ambassadors, supporters and as our ‘sounding board’. The NOVELTEA team worked very hard on the preparation prior to launching our campaign. We observed different crowdfunding platforms and studied their strategies in order to be successful. Furthermore, Lukas in particular, analysed various pitches and videos, their marketing plans and involvement of lead investors in place at an early stage. We worked hard to offer a valuable and innovative product to the market, and people recognised our quality. We reached our initial target of £120,000 within the first day of going live, and raised the bar for a £220,000 overfunding target. We believe that preparation and grit are the key to success and we were proven right. Our short-term goal is to stock NOVELTEA in all major cities across the UK and to continue to expand our customer base. Our vision and ambition remains to develop NOVELTEA as an international brand, but more importantly to establish alcoholic tea blends as a new product category. NOVEALTEA represents a quirky spin on tea tradition, bringing home the exciting flavours of the world, connecting people by drawing cultural bridges around the concept of tea and spirits. NOVELTEA has a rich, smooth and distinctive flavour, developed from an 8 hours cold-brew tea. Both the Tale of Earl Grey and the Tale of Tangier can be served cold on ice or hot as a classical tea, garnished with a few mint leaves or slice of orange to bring out the best in flavours. Passionate about collaborating, creating & innovating. German by birth and Geordie by choice. NOVELTEA is Tea Venture ́s first brand and aims to disrupt the alcoholic industry by introducing a distinctive product-portfolio around the concept of tea and alcohol. NOVELTEA has been successfully introduced in April 2017.